The City of South Bend, with consultants Opticos Design, Inc. and Incremental Development Alliance, have led a series of community workshops and engagement opportunities to develop a neighborhood plan for the Near Northwest Neighborhood. A neighborhood plan looks at the overall area and uses the community’s vision as a basis to provide a broad framework which identifies principles and concepts for future development and improvements. Neighbors and community members are invited to attend the April 9 evening presentation to learn more about the ideas developed through the public workshops and engagement opportunities, including the opening presentation and public input session on February 6 and the four-day public workshop held March 9-12. The final plan document will be available Summer 2019. 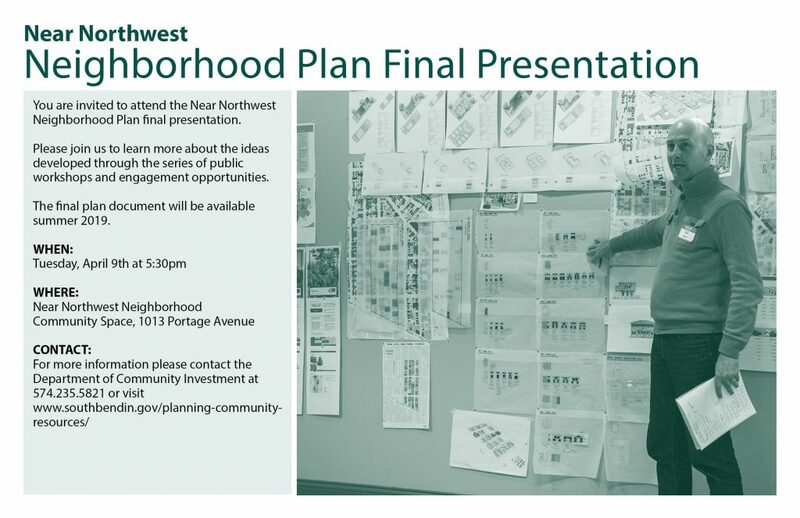 For more information visit www.southbendin.gov/planning-community-resources/ (under the Near Northwest Neighborhood Plan). Who: City project team members & Opticos Design, Inc. When: Tuesday, April 9 from 5:30-7:00 p.m.
Where: Near Northwest Neighborhood, Inc. Community Space, 1013 Portage Ave.